Recommended Use: As a dietary supplement take 3 grams (approx. 1/2 teaspoon) with water or any other beverage per day, or as directed by your health care practitioner. Glycine is a conditionally essential amino acid used for structural protein synthesis, detoxification pathways, neurotransmitter function, brain health, sleep support, and healthy blood sugar levels. Glycine Powder offers the amino acid glycine in a pure powder form for flexible dosing and patient convenience. Glycine is a conditionally essential amino acid used for structural protein synthesis, detoxification pathways, neurotransmitter function, brain health, sleep support, and healthy blood sugar levels. It is a primary constituent of collagen, making up over one third of the total amino acids in this key structural component of blood vessels, skin, bones, cartilage, tendons, ligaments, and other connective tissue. 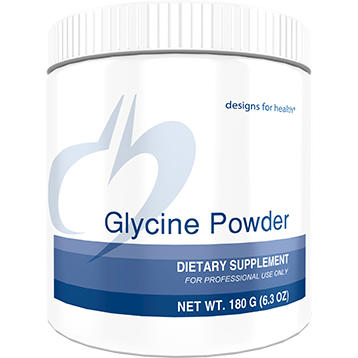 Glycine powder mixes well in water or any other beverage, and may be beneficial in supporting normal muscle tissue repair post workout. 3g of Glycine per serving.